Giant ruckman who was used with good effect in attack. Byrne didn't figure in Ron Barassi's plans at Melbourne, but he quickly became a senior regular at Glenferrie. He spelled Ian Paton in the ruck and averaged around a goal per game during his time at Hawthorn. 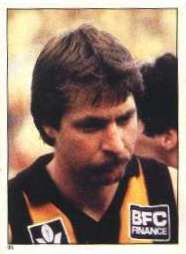 He was a star in the 1983 premiership side, but he was also prone to erratic displays, such as the horrendous day in June 1985 where he kicked eight straight behinds (his teammates fared little better, booting 11.31 in total). The rise of Greg Dear in the ruck and a more traditional forward set-up limited Byrne's opportunities at Hawthorn, and he moved on to Sydney in 1987.